Foto Friday CXVIII – ..:: NJ Brideau ::.. Happy New Year! For the first post that I have penned in 2015 I invite you to follow me down the rabbit hole. We will be decending in a counter-clockwise direction for about 50 meters and 400 steps until you are dizzy and ready to stand still for a few minutes. What have we just traveled down you ask? One of the towers of the Nativity facade, the oldest part of Antoni Gaudi’s unfinished masterpiece La Sagrada Familia, a huge church in central Barcelona. 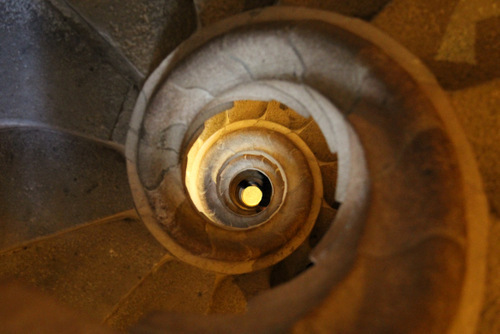 More pictures from Barcelona and from Gaudi in the coming weeks. It looks like a nautilus!